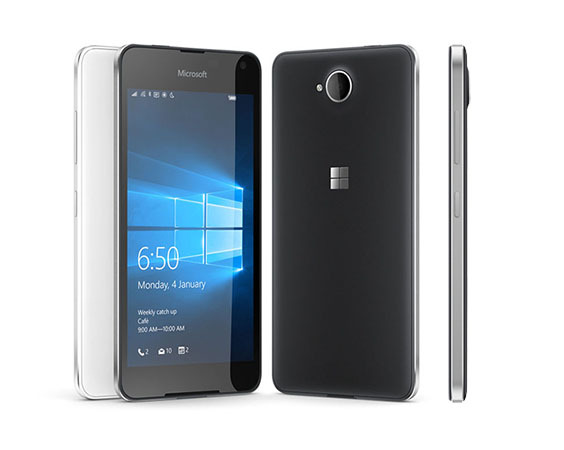 After release of Flagship Lumia 950 Smartphone; Microsoft launched a budget phone with pre-installed windows 10. This handset is not rich in specification as its Android counterpart devices of this price group. The key features of this handset are 5.0 inches OLED display, 8 & 5 MP camera, 16 GB ROM with 200 GB external SD card support, 1 GB RAM, 2000 mAh battery. Here we will have Short review, Pros and Cons of Microsoft Lumia 650. Let’s start from its look and design which somehow feels better than Lumia 950; the body is constructed by aluminium frame and back is made from thin, matte-black plastic. It is good to see that company manage to have a thin 6.9 mm body with 122 grams weight that feels comfortable to hold in hand. Right edge has Volume rockers and power key as well, on the bottom standard micro-USB socket is located. We are also quite impressed with the picture quality delivered by the OLED screen that is quite crisp while that can be much better if they upgrade its resolution to 1080 (full HD) from 720p. It has 297 ppi of display density. After all we can say that there is no matter of complaint about the display which is also protected by the Corning Gorilla Glass 3. It has 8 MP primary camera that can record 720p videos which is quite disappointing while mostly even entry level handsets can record 1080p videos. The picture quality of the camera is pretty decent, its camera sensor is doing quite good job in taking outdoor photographs. But still you can’t expect too much from this phone, it is lacking phase detection and optical image stabilisation as it is kind of entry level phone. Its shame to see the outdated chipset in $200 with windows Smartphone having its latest windows 10. We didn’t get the companies strategies behind this step; while they Announced Lumia 640 in March 2015 with Snapdragon 400 and now in 2016 company released Lumia 650 with Snapdragon 200, while they should release it with some decent or newer version of chipset for giving best windows 10 experience to its customer. The performance of this handset is quite smooth but as we start loading it with apps it takes longer time in opening apps. Although for normal day to day use it works pretty decent. We have again objection for its battery which is 2000 mAh (while Lumia 640 has 2500 mAh) while you can have about 24 hours Battery backup. The design and look of phone is classy. Camera photos are pretty clear. Supports External SD card up to 200 GB. A crisp and vibrant display. OTG cable is not supported. Not able to record Full HD (1080p) videos. Bit expensive as compare to android devices. As we thought Microsoft will release Lumia 650 with great upgraded specs from Lumia 640 but they disappoint us as they downgrade the CPU and battery. Apart from many negativities phone has many value added things such as you can be easily impressed with the craftsmanship of the handset that looks cool, the camera quality is relatively better but you still can choose Lumia 640 and Galaxy J7 as alternate.